All good things must come to an end, and therefore the limited-edition Gennadi Design Designed Ford GTX1 too will shuffle lose this mechanical coil. The company will only be taking orders for the popular roadster through August 2008, so if you like your GT chopped you'd better come up with $38,000 quick. And by quick we mean you have approximately seven months to come up with the cash. For those who don't remember, the GTX1 debuted at SEMA to much fanfare. Press release below the jump. It seems true that all good things must come to an end and so it is with the Ford GTX1 concept car that was designed by Kip Ewing of SVT Division for the 2005 SEMA show in Las Vegas. The car was an instant hit at the show. Plans to build a limited production run of the GTX1 were laid and agreed to between Ford Motor Co. and Genaddi Design Group. Clients could now upgrade their Ford GT Supercars into the GTX1 Roadster version at Genaddi Design Group's facilities in Green Bay, WI. A limited number of 500 GTX1s, built to the customer's request, plus an additional 100 SEMA edition cars, built to duplicate the car that appeared at the SEMA show in 2005, were available. 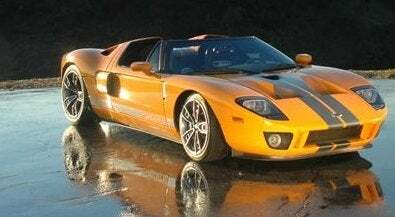 Only about 100 GTX1s have been ordered and completed by Genaddi Design Group but like the original run of the Ford GT Supercars, the build cycle for the GTX1 was, and is limited to two years. The GTX1 was made famous by numerous magazines worldwide, countless videos and U-tube shows and even famed car aficionado Jeremy Clarkson of the BBC TV Show Top Gear. He claimed while driving the GTX1 that it was one of the best cars he had ever driven. The GTX1 is listed in the NADA book and is a collectible icon that will increase in value and collectability now and in years to come. The GTX1 is only available for an additional 8 months with orders being taken until August 31st, 2008. If the number is met of 600 units for the build, great, if not the lucky ones that own a GTX1 will see their investment portfolio increase in value by owning one of these rare supercars.